Give your favorite craft beer an apt handcrafted opening with Alexandra Paliwoda's opener. Give each bottle of your favorite craft beer an appropriately handcrafted opening with Alexandra Paliwoda's eye-catching tool. Made from recycled steel and traditionally hand forged, it embraces the organic imperfections of the blacksmith's craft. 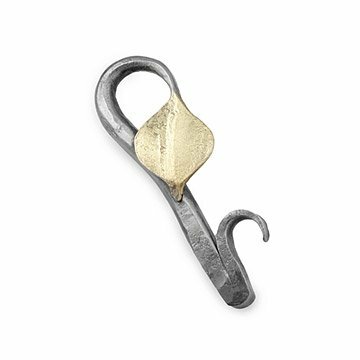 The brass-finished Aspen leaf handle feels great in your hand and lets you hang this work of utilitarian art on a kitchen or man cave wall. Finished with an environmentally friendly clear coat to protect the patina for years of use. Handmade in Driggs, Idaho.